What are emergency dentists? Emergency dentists are the saviors of life, the superheroes who stop us from bending over with our hands clenched murderously around our jaws. They are the people who save us from the wrath of the miniature yet devilish monster that seem to be feeding off our gums and crushing our teeth slowly and painfully. They can solve all our teeth-y problems at a minute’s notice with a very small amount of pay in return. They are our paid superheroes. Kind of like hit men, but for teeth monsters. A city called Allentown, situated in Lehigh County in Pennsylvania, with a population count of 118,032 has a lot of demands for various facilities.Given the massive population of Allentown, it should come as no surprise that there are many help centers available for its residents,which ensure their safety in their hour of need; one of these facilities assumes the form of emergency dental clinics and dentists. Be it a simple loose tooth or bleeding gums, these dentists will always be able to help you. All you need to do is call and make an appointment, or even just visit their clinic directly when you need help. Find Pennsylvania 24 hour dentists today. 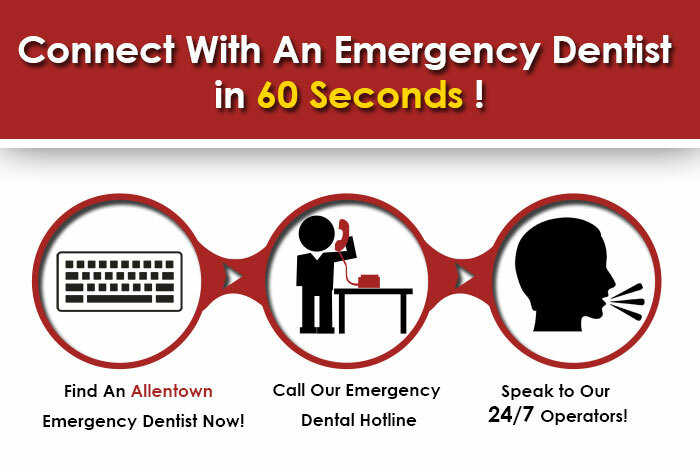 If you cannot find what you need in Allentown and you don’t mind travelling there are plenty emergency dentists in Philadelphia. Allentown dentists are trained and will offer you the best service in the lowest expenses. They offer services in cosmetic dentistry, general dentistry, and a new form of therapy called the Oral Appliance Therapy for Obstructive Sleep Arena. The patients are given the highest priority when it comes to the service, and a wide variety of payment methods are accepted here, which makes it more convenient for the emergency cases. Call them at (610) 616-3593 or visit their clinic in 2015 W. Hamilton St. Suite 202, Allentown, PA 18104. Fairmont Dental Associates is a general and cosmetic dentistry with skilled dentists and a good team who can take all your dental worries away from you. Some of the services they offer are dental exams, dental fillings, porcelain veneers, crowns or caps, dental implants, root canal therapy, gum treatments, dentures, braces, invisalign, etc. If you have a certain dental crisis, call them at (610)435-1288, or go to their clinic at1414 W. Fairmont Street, Allentown, PA 18102. Family Dental Service has been serving the Leigh Valley for almost over 25 years. Their team of specialists include an oral surgeon, orthodontist, and an endodontist who have all been trained in the latest dental advancements. Their general dental services include tooth color restorations, bleaching, crowns and bridges, implant prosthetics, extractions, root canal therapy, periodontal care, full and partial dentures, and orthodontic care. They can provide all treatments for all sorts of dental emergencies and more. Visit them at 123 North 13th Street, Allentown, PA 18102 or call them at (610)434-9660 to make an appointment. Looking for emergency dentists in Lancaster, PA?